U.S., Mexico, and Canada 2050 Climate Targets are on Track to Limit Warming to 2°C, if Rest of World Acts to Cut Emissions. Developing countries would need support to reach peak emissions 2025-2035 and then cut at least 3% per year thereafter. Today the U.S., Canada, and Mexico announced their 2050 greenhouse gas emissions targets. 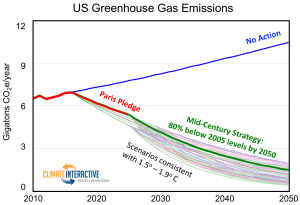 For these Mid-Century Strategies (MCSs) to be consistent with the Paris Agreement goal of limiting future warming to “well below” 2°C (3.6°F), all other countries would need to reach peak emissions by approximately 2030 and then cut their emissions 3-10% per year, according to new analysis released today from Climate Interactive and MIT Sloan. The U.S. and Canada announced that they would reduce their emissions 80% from 2005 levels by 2050, while Mexico pledged to reduce its emissions 50% from 2000 levels by 2050. These are ambitious goals and show strong leadership by the nations of North America. However, no one nation can limit warming to well below 2°C. Therefore, these mid-century strategies must be evaluated in the context of what all other nations might do. We find that the U.S. and Canadian mid-century strategies are consistent with limiting warming to no more than 2°C, if all other nations act aggressively to cut their emissions. However, the US and Canadian plans, while ambitious, remain at the high end of the pathways that succeed in limiting warming to the 2°C level, increasing risk. Their plans are currently in the range of more than 600 scenarios that could limit expected warming well below 2°C (3.6°F). However, they are at the high end of the range, requiring all other countries to successfully implement emissions reduction strategies deeper within the envelope of their respective ranges. 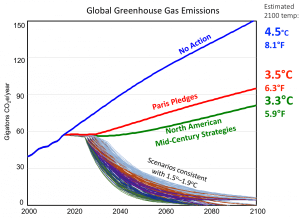 Neither the US nor Canada strategies are within the range of scenarios that would limit warming to 1.5°C (2.7°F). 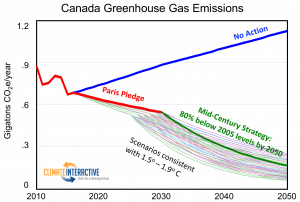 To be consistent with limiting warming to 1.5°C, the U.S. and Canada would both need to cut their emissions earlier and deeper than they pledged in Paris and then cut emissions approximately 87-94% below 2005 levels by 2050. None of these scenarios can limit warming well below 2°C unless other nations, including developing nations, act as well. Deeper cuts by the U.S. and Canada would leave a larger share of the remaining carbon budget for developing countries. Mexico’s leadership in having enacted national policy to reduce their emissions 50% from 2000 levels by 2050 and align their commitment with the U.S. and Canada is significant. 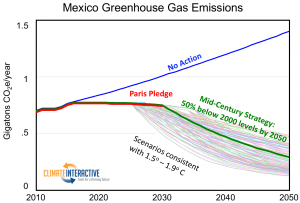 Mexico’s pathway falls well inside the envelope of successful scenarios in the Climate Interactive/MIT analysis and sets an example for other major emerging economies. India would need to reach peak GHG emissions between 2025 and 2035 and cut emissions at 2-9% per year thereafter. Russia would need to reach peak GHG emissions between 2025 and 2032 and cut emissions at 4-10% per year thereafter. China would need to reach peak GHG emissions between 2025 and 2030 and cut emissions at 2-9% per year thereafter. Other emission scenarios for the fifteen top emitter nations/regions of the world are available at ClimateScoreboard.org. The North American mid-century strategies would reduce expected 2100 temperature 0.2°C, from 3.5°C to 3.3°C. The analysis used the C-ROADS (Climate-Rapid Overview and Decision Support) policy simulation model, which is calibrated to the Intergovernmental Panel on Climate Change’s (IPCC) Fifth Assessment Report results. C-ROADS was developed by Climate Interactive in partnership with the Massachusetts Institute of Technology Sloan School of Management (MIT Sloan). C-ROADS is free and downloadable for public use.